I’m generally not one to solicit prayers as I lead a pretty secular life with the exception of my adventures in UU land. Being UU, I know and appreciate the fact that everyone has their own spiritual path and far be it from me impose rules about how you should pack for your journey. So I’m just going to take a moment and ask you to pray, breath, think kind thoughts, send positive energy, meditate, whatever it is you feel called to do, for my grandma H tonight. She’s been battling pneumonia for the last week and my family is really worried about her. I know I’ve mentioned her in lots of previous posts. She is my mentor, one of my favorite people on this planet. She was diagnosed a few years with Alzheimer’s and I’ve been dealing with the vacancy of our relationship since the days when she first started forgetting my first name or how I fit into her life. I care for her a lot. 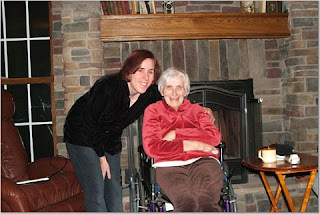 I visited her myself this past weekend and I started to write a blog entry about the experience of walking in a dementia/Alzheimer’s ward at the nursing home, but I lost the gusto to finish that entry and I’ve left it saved in my directory to finish later. Suffice it to say, the experience leaves a feeling like a lead weight in my stomach, but I do it every time because I love her. God, give me the strength to accept the outcome of my grandma’s dilemma, whether it’s to bear further witness to her last days or the unwanted ending of a life I cherish. Okay, a little dramatic. And, admittedly, it sounds like the Serenity Prayer. In my own eternal recovery process as a widow, I’ve found the Serenity Prayer to be one of the most centering and comforting mantras… So probably 90% of the very few prayers I say sound like that. I always feel like I need to take responsibility for handling those things I ask of a greater power. If there is a greater power listening, I’d prefer it give me something I could actually use to better my life–like courage and strength–than a pot of gold or a miracle from the sky. Besides, if there is a greater power, all the prayers in the universe are not going to stop the hands of time or change an entry in the course of past and present history. What is to be will be. Why am I so DEPRESSED?! I break here to explain that I don’t answer my phone if I don’t recognize the number–I have this weird fear of talking to people on the phone who I don’t know. To call a stranger, I usually have to prepare myself for the call by practicing what I will say when they answer, anticipating all the questions they might ask and thinking through my possible responses. So, naturally, I don’t answer the phone if I don’t recognize the caller ID because I haven’t had time to prepare myself to respond to the person and it makes me incredibly nervous. Can you believe I actually worked on telephone support for a software company once? Let’s just say that it definitely did NOT cure my fear of talking to that unseen stranger. It’s dysfunctional and stupid, I know. What’s less imposing than someone on a phone? You can just hang up on them if they are being rude, right? Well, for some reason or another, I’m more afraid of people I can’t see. Anyway, I let the call rollover into voice mail. A minute later, the voice mail tone alerted me that there was a message, so I dialed in to listen. It was the lady with whom I was supposed to have that interview. Doh! She’s calling to ask where I’m at and hoping that I’m on the way. Here’s the hitch: I can’t call her back because the hospice rolls their calls to an answering service after four. I tried anyway and she was right; I couldn’t get through. The feeling of panic that washed over me when I realized that I had the date mixed up and I was missing the interview I was supposed to be at…. I usually don’t get over-worried and stressed about these kind of things, but this time, we’re talking about my possible future–the career path that may be, for the first time in my life, the one that fits and fulfills me. I could have potentially blown the one opportunity that I was looking forward to beginning all year. It’s a volunteer position, but they have all this rigamarole and hoops to jump through to get there. I respect that because, as much as you need volunteers, you probably don’t want just anybody volunteering at a hospice. I’m pretty sure they want to make sure you’re serious. After this interview, should I have made a great impression (as I was planning), I would have been invited to a week long training in April. I felt like I was going to get sick to my stomach. I know that I can probably get her to reschedule, but this sure looks like I’m an irresponsible heel. Sure, people make mistakes and mix things up; however, this would certainly be a mark against me in a real job interview. I want to be the best volunteer I can be. I don’t want to be known as the volunteer who is not reliable because she misses appointments or shows up late. This position is very important to me because I was going to use it to determine if I could handle working in grief situations (not to mention the fact that I would just like to feel like I’m somehow helping someone in something that is to me vitally important). Other than that, I’ve just been feeling plain depressed all week. And restless. I’ve accomplished nothing in the evenings after work and I’ve only worked out once. I feel trapped in my career. If I can’t start my counseling venture immediately (and I can’t because I don’t even know yet if my desire to be a counselor is more than a passing flare of an idea), I sure wish I could apply my creative skills for a job somewhere. Creative jobs don’t pay much, though, and I’m quite used to my lifestyle. I’ve always thought I could do marketing, but those jobs are pretty much awarded from the “bottom up,” meaning that you have to collect the trash for a marketing firm for several years before making it up to making small beans with the actual concept people. Sometimes it seems too painful to dream… The more you dream, the more frustrated you become when things just don’t work out the way you planned. I wish I was like my grandma H who, when she encountered those nasty turns in the road of life, managed to navigate them and still found something positive to say about the experience. I think she passed this trait onto my mom. It’s probably my self-centered view of life, but I always feel like my sharp curves were tougher than theirs. I guess you don’t gain anything by trying to measure your problems with someone else’s. When you’re feeling gloomy, it’s so easy to do that, though. I’ll do it tomorrow morning. I’m not a morning person. I have a morning commute of about an hour to Highland Heights. Though I set my alarm for 5:30am, I mostly hit snooze until 6am no matter how hard I try. That doesn’t leave me much time to exercise, shower, and style my hair to get to work by 8:30. I’m hungry. I’ll do it after I eat. Um… cardio is not that pleasant on a full stomach. I’ve got too much to do. In a house constantly in a state of remodel, I always have too much to do. I’ve gotta learn to just let that go and exercise, and then worry about the details later. Anyway, despite having too much to do, I usually end up goofing off on the internet or watching TV anyway. And it’s not like I can’t work out while watching TV. I’ve actually found that I can tolerate using the trainer if I pop in a DVD. I started watching Harry Potter and the Goblet of Fire on Tuesday when I worked out. That really worked great. I was going to watch Tuesday’s DVRed episode of Jericho yesterday while working out, but I was hungry when I got home, so I watched it while eating. I have two episodes of Big Brother to watch. The only problem with watching shows I’ve recorded on my DVR is that I have to fast-forward the commercials, and there’s nowhere to put my remote on my bike (where it will stay, anyway). I also need to get some kind of equipment for working out my muscles. Okay, to be honest, all I really want to do is crunch my abdomen about fifty-six different ways to get ride of that stupid fat roll at my waist. I wouldn’t give a damn what my weight was if that thing were gone. Michael’s been trying to talk me into getting a Total Gym. I worked out on his and it was pretty cool (my abdomen hurt for two days afterwards). If my basement were finished right now, I’d be more inclined to buy one. The only thing I worry about, though, is that once I have all this exercise equipment in my house, I really won’t work out. But I am tempted when I think about all the gym fees I won’t have to pay if I can do it at home. No muscle heads around to watch me do my wimpy lateral pulls at 20lbs. My coming trip to Colorado, although short, is much needed. I hope to catch up with a few friends while I’m out there. For some reason, I’m completely obsessed with driving the car myself all weekend. I have this vision in my head of how it used to be, that feeling of complete contentment as I viewed the impossibly brilliant scenery through the windows of my car. I used to drive every morning from my suburban town north of Denver to Boulder (sometimes I rode my bike). Driving to Boulder, you are looking straight at the Flat Irons. I knew those peaks not by name but how they looked each season. I knew every crease in their jutting rocky surface. There is not a day that went by where I was too acclimated to Colorado life to not notice the beauty of the world in which I was immersed. I wonder how many years you’d have to live there to become immune to that landscape. It can’t be possible. Ohio has its moments, though. We’ve been hit with snow for the last couple days and I can’t help but notice each branch on the trees that line the roads on my morning commute; each branch is highlighted icy white. Piles of snow everywhere, streets carved through it. There’s a beauty there too. At least I’m not too depressed that I don’t notice these moments in nature. Then I come through the doors of the place where I work and my mind goes numb as I struggle to motivate myself to concentrate on the task at hand. 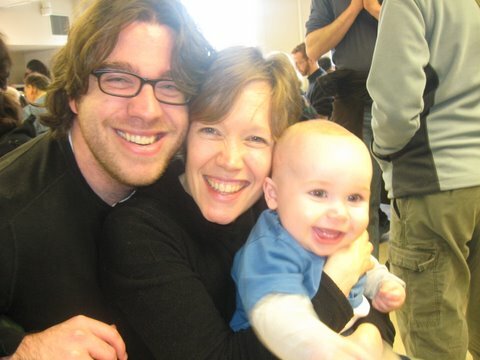 I have always been the most skeptical because in the one relationship in my life that worked, my husband and I had the same political leanings, even to the point of coordinating our voting efforts, and we were in the same place religiously (which is to say, we weren’t). Yet, I look at this couple and I see the love they share. They’re about to have their first child and, though they joke about swaying her toward their personal political persuasions, I can tell they are going to make caring, loving parents. Though their child may absolutely hate politics when she grows up. For years, I looked at their relationship and I thought, “Well, that works for them. But it would never work for me.” I had different standards, more passion. I could never cross the line of falling for someone who did not meet my criteria of age (within 5 years each way of my age), financial stability, politics (liberal), religious beliefs (liberal and really only recently found). Age, religion, and politics, I thought, were my most important requirements. I was so angry with him. Yes, you damned well can! I wanted to scream at him. I have control of my emotions, I thought. I don’t have to give into my baser emotions. I can be attracted to someone and not follow through because I know it won’t–it can’t–work. I felt I was above the absent-minded choices people make in their love lives. When we dream of love and romance, we think of it in terms of the ideal. Seldom do we actually get all of our desires fulfilled when compared to our vision of the perfect person. In our wistful day dreams, our lovers don’t fart or have body odor; they don’t leave all the lights on in the unoccupied rooms of the house; their kisses make us dizzy all the time, every time. Our dream lovers never fight with us and they tell us we are beautiful all the time. It’s ridiculous to expect anyone to meet this vision and yet, I think, most of the time, we still try to find our image of perfect. It’s those differences that add the spice to the relationship, those little perspectives that make you see the world through the eyes of your lover. Mike viewed everything as if through a fun-house mirror; he always had a slightly bemused grin on his face as if he wasn’t literally seeing everything around him the way everyone else did. Sometimes he kidded too hard. Other times, I just couldn’t believe the words that fell out of his mouth. He often took the opposite side in an argument just to, as he said, “see if I had thought out my points.” I always hated that. Yet, when I think back on our relationship, that little annoyance makes me smile. At the same time, we shared a passion for climbing and camping. We used to sing the soundtrack of Cabaret to keep us awake on long road trips. We listened to Garrison Keillor and A Prairie Home Companion on Saturday nights and we thought we were ever-so intellectual. We weren’t the same, but we were very much alike still. My relationship with him has become my vision of perfection. Because it worked. When someone’s philosophies are so opposed to yours, it’s very hard to find their view of the world as “cute.” You end up having to avoid the subject because you don’t want to cause waves and, maybe, you just don’t want to see the world the way that person does. You’d rather just close your eyes to that aspect of his or her personality. If you are avoiding an aspect of their personality, can you really love them? In the case of my husband, I loved everything about him–even his quirky theories and ideas, even the opinions with which I did not agree. Nothing he thought was scary per se. Our philosophies never crossed. There is also the theory of “yin and yang”: opposites attract. In Chinese philosophy, two opposing forces compliment each other to make a whole. It’s a nice theory. Does it work in real life? It always seems to me that the two sides would always be struggling against each other, breaking apart the unity. The couple mentioned above are the only ones I know who seem to cooperate well as opposites. Most of my other friends have similar-minded mates. In fact, I feel a pressure from them to not date “outside of our mindset” because I’d be sacrificing some vital part of myself. I fear they’d be disappointed in me for spending my time with conservative. One friend, upon learning that I might be seeing someone from the “other side,” tisked me and shook his head sadly. Maybe all of our romantic confusion boils down to hormones. For some reason or another, there are certain people we find ourselves inevitably attracted to, sometimes even when we know it’s fatally wrong. It’s the curse of our ceaseless urges to procreate–an urge that has not subsided despite our move to civilization, stability, and family. We always return to our baser instincts. Yet, is it all as simple as hormones? Sometimes you just have to admit that despite the utter illogic of it, you simply enjoy the company of another person, even when he or she don’t meet all of the important criteria on your list. It’s not desperation because you’re fine and stable and quite happy on your own. Desperation implies staying with someone who is bad for you just because you don’t want to be alone. But finding contentment with someone else who you know you could let go at any time, if you really wanted to–someone who treats you with the respect and gentleness you deserve–is not desperation. It’s genuine affinity for someone. What makes you have an affinity for someone with whom your philosophies are so drastically adverse? Perhaps there are other things you enjoy doing together. Maybe those religious and political differences you thought were so important aren’t really so high on your list. But how could that be? And, are you flirting with a relationship that is inevitably doomed to failure? While these things are not so important when you’re dating, their weight might increase if the relationship progressed, for dating is much less serious than day-to-day contact. How do we know which of the choices we make in life are the right ones? Sometimes, I really wish the path of my life would unfold before me so that I can see where it leads. I know that every day I make choices that affect the outcome. Once in awhile, though, I long for some internal compass to guide me in the “right” direction, the road where the terminus is somewhere I always thought I wanted to be. I’m afraid that I’m going to waste my life, fumbling around in the dark for my flash light, and when I reach the end, I’ll haven’t fulfilled any dreams and all I’ll have is a life of dirt roads that cut paths like spaghetti, all random and criss-crossing and intersecting. I’ve been in love many times. I had a great love once. I still know nothing about love or what it means or how one finds it. I’m just as confused as everyone else. As I get older, I start to wonder about the checklist I made up a long time ago that catalogued the qualities I was looking for in a husband. Perhaps my devotion to this list causes me to discriminate against otherwise worthy men. It’s hard to find someone this way because we don’t wear a patch on our sleeves that states our philosophies outright. Sometimes I wish we did. That way, I could immediately avoid–before even having a conversation to lures me in–those men who might not meet my sacred criteria. But I suppose that would cause more problems than it helped, for we would all become isolated from each other, avoiding conversations with all those people with whom we did not agree. Our society’s problems would only get worse when we ceased to communicate. I’ve always been told by therapists that my Checklist for Mr. Right was a very good, organized way for finding the right guy. I had done what they felt so many other people needed to do to help them sort the flowers from the weeds. However, my checklist only results in one type of flower. In the garden, there are many different kinds of worthy plants, not just flowers. Maybe it’s not so important that someone be the same religion as me or have the same politics, but that they treat me the way I always expect a lover to treat me. What is love, anyway? What really makes you love someone for real? I’ve always thought it was having almost everything in common with just some minor differences (as it was with Mike). How can you love deeply, as you would have to in a committed relationship, when you don’t love every single thing about the person? Maybe I have a stupid, foolish idea of what love is all about. My friend’s words still haunt me. You can’t help who you fall in love with. Is this true? And if you can’t help who you fall in love with, should you always follow through with those feelings? At what point do you take a chance on someone whose qualities don’t match every item on your list, and just let go enough to see where it leads? this one posted at the top of the North Face. Ahhh… swish, swish, the sound of my skis slicing powder as I execute graceful turns down lingering long slopes on a beautiful, sunny February day. 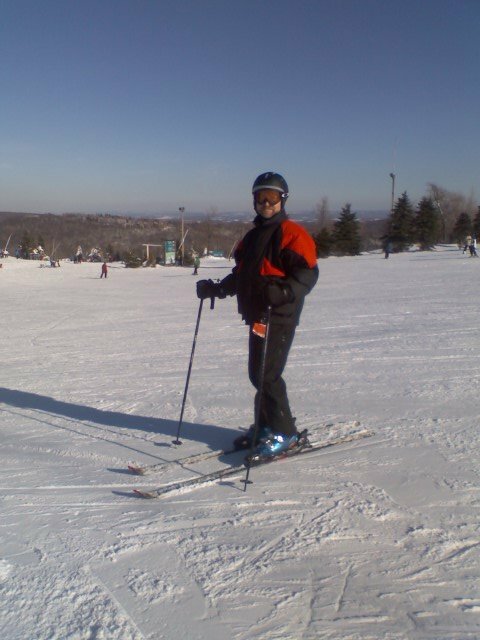 Michael and I took a day trip to Seven Springs yesterday to enjoy some skiing. I’m proud to say that on my first run I went directly to a blue slope, resolute and confident that I could make it down successfully since I’d started to warm up the last time we went two weeks ago. I was a little rickety again at first, but after several runs down this beautifully sloped and just-challenging-enough run, I found my ski legs. After a short water break midway through our day, I was finally ready to venture out to the North Face where all of the longer, but most difficult, runs awaited me. Our first pass down that side of the mountain went down a nice blue. I followed Michael through some trees along the run (also called “glades” in ski terms). I haven’t done glades since I was a much better skier, back in 2001 when my husband and I were playing amongst the trees on the Tannenbaum side of Holiday Valley. The trees on this run in Seven Springs were spaced pretty far apart and I found that I could execute turns away from them with ease. The fun of skiing through the trees like that–the part that makes skiers do it despite the obvious dangers–is the almost spiritually romantic quality about moving among the trees. It’s slightly quieter and atmospheric, pretty. For a moment even on a busy slope, you can feel alone with nature. Skiing to me has always been like a graceful dance down the side of the mountain. When your feet move the right way, it’s a peaceful swoosh in the silence of the snow, leaving perfect little “s”‘s that mark your descent. There were times in Colorado, where the runs are much longer, when I was completely alone in a section of the run. As I did my little ski dance, the snow falling gently around me as one memory stands out, I felt at one with the mountain. Breathing hard from the work, my lungs felt clear as they took in each nose full of pine trees on the stale chilled wind. Something about cold air filling my lungs always makes me feel clean, purified, even if sometimes my asthma protests with a hackey cough. Some downhill ski for the sure thrill of speed, I suppose. I won’t deny that I love speed as well. But as with cycling, I’ve never been the fastest. As with cycling, I find that the effort and strain on my muscles to do these things also makes me see the world around me. I enjoy the adventure itself more than anything else. Being is doing. Now I don’t want to make it sound as if my adventure yesterday was all grace of dancing. When we got to the North Face, I had some moments of fear as I stared down the steeper slopes of the black diamond runs. I found myself a little put off by the bumps some of these otherwise doable runs contained. I still haven’t figured out what you are supposed to do with “bumps”–these almost moguls that plague the steeper runs. If you end up skiing on them, you risk being unable to turn in the heavy snow which may catch your ski and cause you to fall. To ski around them seems to require some advance planning in your descent, which is difficult for me at high rates of speed. A few times, I admit, I stopped halfway down a slope and just stared down at Michael, waiting patiently but frustrated with my lack of confidence. I was afraid to move. I needed to turn, but I was glued in place. 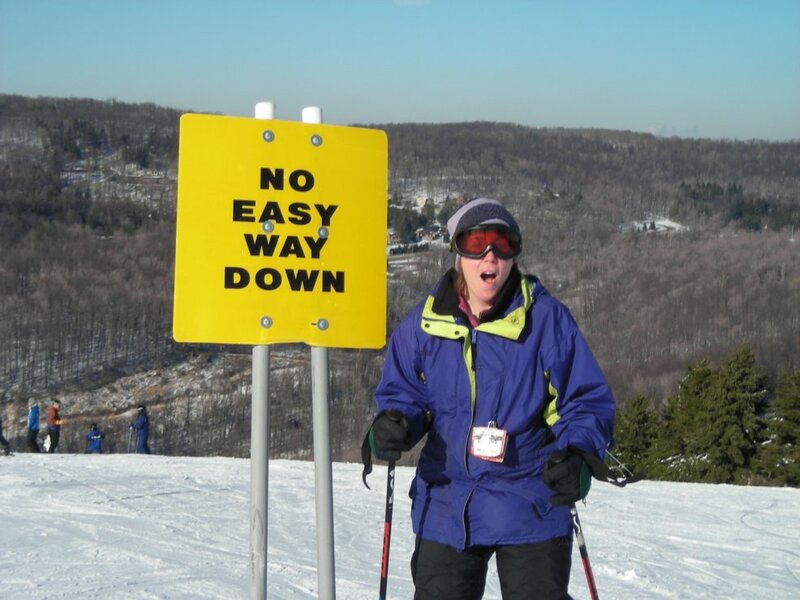 After all these years of skiing, I’ve finally realized one important thing: If you stop skiing on a steep slope, it’s only harder to start back up again. To try to get myself moving again, I have to convince myself that I know how to turn–to do the dance. On a steep slope, one where I’m just a little bit afraid, I can’t seem to talk myself into just heading down. I have to find some place to turn, some place safe with lots of power, so that I can execute a snow plow (which immediately marks you as someone who shouldn’t be on that hill). Snow plowing is very scary and very hard on a steep slope. But because it’s the first move you’re taught when you’re learning to ski, it becomes a safety net because it’s the one move you feel you really know how to do (it takes a long time of snowplowing before you figure out how to parallel ski). Of course, in Colorado, the “More Difficult” blue square runs are like the black diamond runs in the Northeast in most cases. Another reason I had to do the black diamond runs here, for they will be my “More Difficult” runs in Colorado. Out west, there’s even the occasional further distinction among runs, ones labeled “blue black” because they aren’t quite black diamond quality, but they are harder than a blue. I guess when you rank slopes using only three colors and shapes, you’re bound to come to some confusion in the distinction among difficulty levels. This system is not all together consistent across the country, often leading to many disappointed beginner-level skiers at various western resorts (Taos in New Mexico being one of the most often attacked). Well, I did have a great day out on the slopes. Yesterday was much better than my first time out this year. My skiing improved and I did meet my ultimate goal of doing a few black diamond runs. I definitely had a lot more fun which, of course, only made me more excited for Colorado in two weeks. I look forward to two days of skiing in the awesome powder of my favorite mountain range. I miss that place. It really feels like home to me there. Anyway, in the style of my favorite blogger who has recently fallen madly in love with a man she met on vacation, I’m soliciting you to share your drippy romantic stories of deep respect, love, or mad passion. What did you do yesterday? And no scroogey “Valentines Day is a commercial holiday aimed to keep card companies in business and I refuse to celebrate it” comments. I dated about three of those type of men and, frankly, I’m just a bit tired of this excuse for laziness and avoidance of feelings. Whatever happened to the nice gentlemen who opened doors for ladies? I think the feminists of the rabidly angry variety have scared them all away. I’m a feminist, but I still like a guy who treats me like I’m something special to him. It’s all reciprical–one act of kindness breeds another. These are the kind of things you do when you are smitten or in love. You can’t help but want to do things nice for someone for whom you have romantic feelings. At least, that’s how it’s always been for me. Yes, it’s true; Mars Girl is a hopeless romantic. But let’s try to keep that between you and me. And, why not? It was money I didn’t know I have. I surely don’t miss it right now. Times are hard and my guess is that charitable organizations are having just as much trouble gathering funds in this economic crunch as every other business. I never much cared for our government’s hedonistic philosophy of “spend today, worry about the deficit tomorrow.” It’s counter-intuitive to the way my mom taught me look at money. Only ever spending money what I had to spare in the bank, I have never been in credit card debt. My college loans are paid off. My overall debt is no more than I can afford to pay monthly. My mom taught me that if you don’t have the money for a luxury, you don’t buy it. I’ve always been good about saving my money so that I have a nice cushion when emergencies come up. I sure wish our government would do the same with our tax money. Now, before you get hot under the collar and accuse me of pointing fingers at the Republicans, I will say fairly that no administration is free of guilt when it comes to unnecessary spending. Or this attitude that we should consume and consume, and then consume some more even when we’re in the negative numbers (though, I will smugly point out that under the Clinton administration, we were in a surplus, just like my own savings account!). Anyway, I just wish the example that our government set was of the thrifty, saving sort of economics that my mother taught me. I think she could teach a class on how to budget and manage your money to our elected officials. It’s amazing what she did on my dad’s income to support a family of four. I had a childhood where I never felt hungry or the lack of financial stability. Yeah, so I couldn’t get designer jeans like some of the other kids. I am not scarred for life. If we all budgeted and balanced like my mom taught, the credit card companies would be out of business. Which I guess is bad for them, but good for everyone else because they could live within their means. But, hey. I’m just a dumb kid from a hick town in Northeast Ohio. What the heck do I know? If you are also feeling philanthropic this economic stimulus stimulating season, and you’re looking for some charity to contribute to, you could always pop a few bucks in for my MS 150 ride. Yeah, this is a shameless plug, I should be beaten for it. But please note that this is one of my favorite charities, which is why I do that ride every year. My grandfather H had multiple sclerosis. I ride for him. And they say the Bible prophets were something hot! This amazing and prolificly accurate quote came from a Republican, nonetheless. Methinks the Republicans of Lincoln’s time were something completely different than the version we see before us today. Our Republicans have sold out to the rich, leaving only the Democrats to pick up the pieces and try to support the poor, hungry, and–most sadly–the struggling middle class. Our Republicans have sold their souls to the religious fundamentalists, the Focus on the Family ilk who seek to morph our democracy into a theocracy. I’m not trying to be self-righteous here in my liberalness–my compassion for humanity and fear of the big corporate world–but, seriously, these are some scary times. You can’t leave health and liberty in the hands of corporations who only care about the bottom line called profit. They’ll keep you medicated on drugs for years rather than cure you of your ailments (money, money, money). They’ll fire you at a moment’s notice and outsource your job to India at a cheaper rate of salary. Gone are the days of the small companies who actually cared about your welfare as a person, who didn’t demand that you continue working only four days after your spouse’s death because, hey, isn’t that enough bereavement time? It’s a cruel and nasty world out there. Who’s profitting greatly from the Iraq war while the economy plummets horribly? I’ll give you one hint: our current VP was once the CEO of this oil corporation. I suppose if you are a government contractor or a construction worker in the effort to rebuild the ruins, you’re doing quite well. Ask the families of 4,000 soldiers how they are doing… Better yet, ask the families of the innocent Iraqis killed in the crossfire–“collateral damage”–how well they are faring these days. 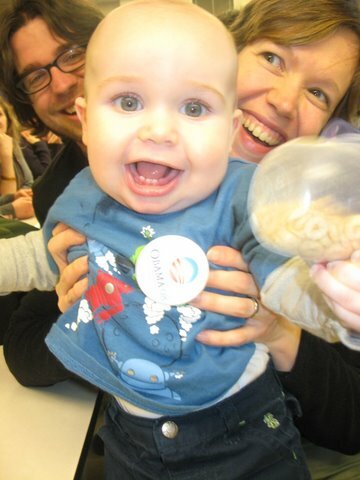 My friend, Sarah, and her husband took their nine-month old son, Max, to the Washington state caucus on Saturday to place another vote for Barack Obama. Max might not make the eighteen year old age requirement to vote, but he sure made a precious cheerleader for our team! Here are some of the pictures Sarah sent me earlier today. As you know, I am not easily enamored by babies, but I have to admit Max sure makes me smile. He takes the best pictures! Looks like Max found a liberal colleague! I’ve been getting a lot of comments lately when out socializing where people mention that they’ve been reading my blog. I become momentarily confused as I try to trace down how this particular person may have gotten my blog address. Not that I’m upset; in fact, my narcissistic artist ego loves the attention. I guess often times I feel like I’m writing into a void, especially when I write entries about widowhood. I hear the sound of crickets and I wonder if I’ve gone too far in expounding on my emotional state or my political views. I suppose my ego wants constant validation. Of course, I know that I’m not great every time or that you may not necessarily have anything to say every time. I want to know who my lurkers are–those of you who read avidly but never comment. Drop a comment and identify yourself. Use an alias, if you must. Tell me how you found my blog (I know I’ve got it listed almost everywhere) and what subject you most enjoy reading about. Are you a blog stalker–someone who checks in every day to see if I’ve posted anything new? And next time, I’ll return to boring you with my regular rambling posts, which may include an exposition of the surprising discovery of a stout beer that I actually like. Of course, it’s seasonal.